You’ll have to forgive me for sending out my ‘Monday Missive’ a little late this week! I’m afraid I’m on the wrong side of the world, in a different time zone, and I’m currently encloistered in a monastery where hi-speed Internet access is not the priority for residents. Actually, I’m not sure if ‘encloistered’ is a proper, word but if it’s not, it should be! Either way, I am very glad to be here and have been made to feel very welcome by the brothers, and this despite the fact that they are all currently maintaining a day of silence! In truth, the contrast between the environment here and that of the casino that I emerged from after the fight could not be greater, but I can elaborate on that later. First things first: let me tell you about the fight! This was Sol’s big chance to prove himself on the world stage. Spadafora had a record of 46 wins, 1 draw and no losses! He is a former world champion, and his team’s plan was simply to use Sol as a stepping-stone to another world title shot. We knew though that they had underestimated Sol. In truth, there is a lot more to the Spadafora story. Like so many boxers, his life has been filled with turmoil and tragedy. He has a history of addiction problems and has spent a lot of time in jail. 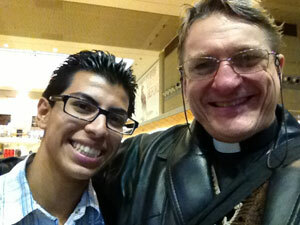 More recently though he has given his life to Christ and is trying to make a fresh start. 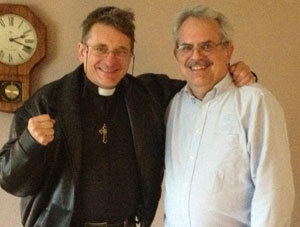 I met with the Team-Spadafora attorney, Joe, before the fight. He is a great guy who has played a key role in the fighter’s recovery. I told him that I was keen to meet Paul Spadafora after the fight. He told me that unfortunately that wasn’t going to happen because it was his young son’s birthday, and Joe was taking Spadafora straight from the fight to go see his son. I couldn’t argue with that! Sol had trained for this bout like his life depended on it. He had spent a month in Las Vegas with Luis Tapia (pictured above) who really impresses me as a manager and as a trainer. As we did the final preparations in the changing-room, there was a real sense that nothing had been left out. Sol had done the hard work in the gym. He was fit and he was ready. This was going to be his night! Unfortunately it was not to be. Sol fought well, and he did his best to stick to the plan – moving forward on the lanky south-paw and trying to stifle his movement. 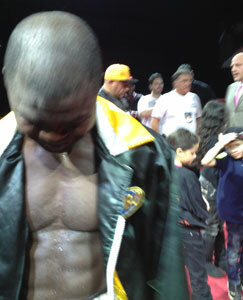 He was certainly the more aggressive of the two fighters and he really started to take control in the final rounds. 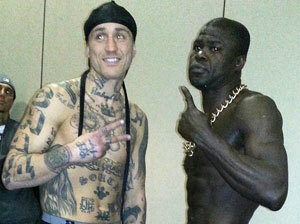 I believe if he’d had another round or two he might have put Spadafora on the canvas. The fight went the distance, and I truly thought that Sol should have been slightly ahead on points. But it’s impossible to win a points decision against a former world champion in his home town. One of the judges scored the fight 100 to 90 against Sol! For those who don’t know how boxing scoring works, that’s ten rounds to zero! That was just a slap in the face. 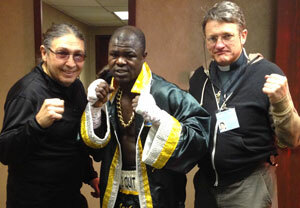 The other judges scored the fight more evenly, but no one gave it to Sol. I think if the fight had taken place anywhere else in the world we would have at least scored a draw. In truth, Sol put in a great performance and I hope that this might have been enough to open some more doors for him in the US fight scene. Time will tell. For the moment though he will return home unscratched, knowing that he did himself and his family and his country proud. I had hoped that these 10 days in the US would be relaxing for me. In truth, they have been full-on! At the same time, they have been terrific! I met up with Fighting Father Ricardo in Los Angeles – a young man who is studying at University and is determined to become both a medical doctor and a Catholic priest and a Muay Thai champ! Ricardo is my sorta guy! 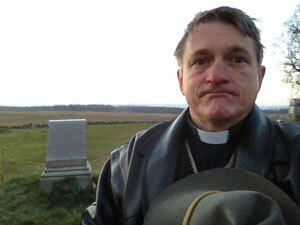 From there I headed to the East Coast and drove to Gettysburg, Pennsylvania, where the great battle took place in 1863. The pic above is of me standing on top of the lookout on Culp’s Hill, where much of the fighting took place on the second day of battle. 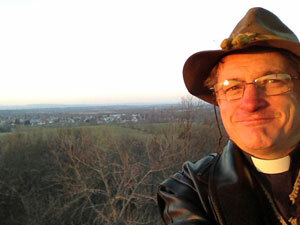 That’s the town of Gettysburg in the background. While on the battlefield, I made sure to pay my respects at the Armistead marker – the monument that marks the spot where General Lewis Armistead fell on July 3rd, 1863, while leading his troops across the stone wall that was held by the Union troops. This point is considered the ‘high water-mark’ of the Confederacy. It was as close as they came to winning the war. From Gettysburg I drove four hours to the fight venue in Chester, West Virginia (the story of which has already been told) and from there I drove six hours north-west to St Joseph in Michigan, where I met up with Fighting Father Rob Burgess – a great guy and a full-time custodial grandparent to his lovely grandson, Colin (who was unfortunately asleep at the time we took the photo). From there I drove another four hours south-west to arrive at the monastery on the Community of St John in Princeville, Illinois, where I am now. 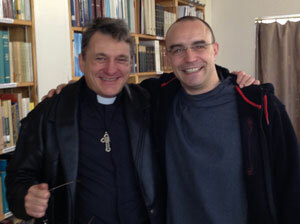 The invitation to be here came from my old friend, Father Iovane, who I met through Father Elias some years ago. He is a beautiful man and this is a beautiful place. I only wish I had more time to spend here. Iovane and I have been chewing the fat about the three years of ministry that he’s just completed in Addis Ababa, and about his visions for ministering to young people where he is now. Who knows but there might yet be a significant work for the Fighting Fathers to do here too. From here I head off early tomorrow morning to drive to the airport in Chicago, where I hope to meet up with some more friends before spending the requisite 16 hours in the air that it will take me to get back home. This entry was posted in Monday Missive and tagged community of st john, egberime v spadafora, father iovane, gettysburg, Traveling Across, US, USA by Father Dave. Bookmark the permalink.